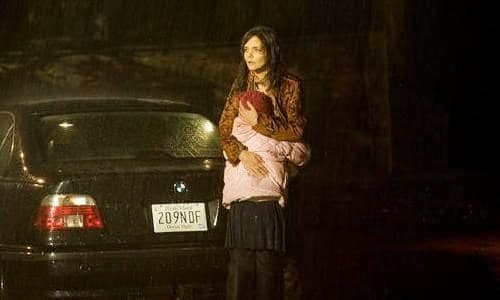 Guillermo del Toro and Katie Holmes have joined forces to craft the horror film of the summer in Don’t Be Afraid of the Dark. From the film’s opening scene, the audience is put on notice: Del Toro’s script is fathomable and feverish in its fear-generating abilities. Guy Pearce and Katie Holmes are Alex and Kim, a young couple with dreams of turning a Rhode Island historic landmark mansion into something worthy of an Architecture Digest cover. They are living in the home as they renovate. The film commences as Alex and Kim are awaiting the arrival of Alex’s daughter Sally at the airport. The star of the film is truly Bailee Madison as Sally, the little girl at the center of the entire movie’s horror. She is sullen. Sally is a child whose parents have divorced and because her mother is too busy with her L.A. lifestyle, she must live with her father and his girlfriend in an opaque manse with an extensive past. Don’t Be Afraid of the Dark is pure del Toro. As in Pan’s Labyrinth, the filmmaker crafts a world where evil lurks beneath the surface, literally. When Sally starts to accept her future living with dad, she begins hearing voices that lead her to a hidden basement that is rooted in historical horror. Evil whispers ensue and to not give away too much, let’s just say this: The film’s tiny but terrifying creatures are pure del Toro. As it becomes clear that Sally’s father is over his head, her exhilarating situation only becomes more searing. The film’s director, Troy Nixey, has some holes in his film, yet none of them extend beyond the usual devices that horror movies use to rivet its audience. Like Steven Spielberg’s Poltergeist, there is a moment that, if you truly think about it, will have you asking a horror movie classic question. Yet, we accept such dalliances because in the horror genre, these plot mechanisms ultimately are easily forgetten given the scope of the scary on screen over 90-plus minutes. Katie Holmes channels her inner maternal instincts and produces a performance as Kim that is equally driven, distant and delirious at the happenings inside her dream home. The location scout for Don’t Be Afraid of the Dark deserves an Oscar nod... if they existed for such positions. Pearce, Holmes and Madison’s abode is a character unto itself. It is pure New England gothic, and the generator of all of Don’t Be Afraid of the Dark’s devilish mayhem.